Squier is going to sell loads of these. The RRP is well below what we'd be prepared to pay. The vibe is sheer Keef Richards! Shame about the wobbly toggle switch. Squier has to be one of the very few brands that everyone has played, owned or considered and, unlike another 'sister' brand we could mention, levels of build quality have, for the most part, remained consistently acceptable. Over the last 18 months, Squier has captured imaginations with the Series 24 and the more metal-influenced guitars of the Showmaster range, yet the most enduring Squier models are always likely to be those steeped in Fender-associated history. At first glance, the use of the word 'Custom' here might prove a little confusing. It clearly refers to the 1972 version, made famous by Keith Richards, but it was actually the Telecaster Deluxe, also introduced in 1972, that featured a pair of Fender humbuckers and the unashamed Gibson Les Paul control panel, albeit with a Stratocaster headstock. The first version of the Custom, released way back in 1959, was a fancier version of the Standard Tele, featuring double edge body binding and a selection of classy finishes. 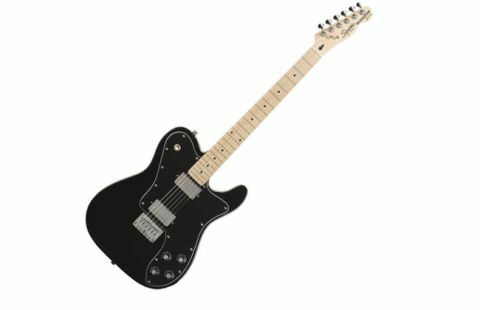 However, Squier Tele Customs these are and, with a substantial agathis body, thick black finish and big scratchplate, these are very attractive guitars indeed. The Custom is loaded with a pair of Squier covered humbuckers that differ slightly from the 'wide range' units fitted to '72 originals both in size and look - one row of six polepieces rather that two offset rows of three - while the Custom II features two Duncan Designed P-90 single-coils. A familiar combination of three-way toggle sited on the upper horn plus a volume and tone control for each pickup allows for an easily predictable level of control and we're reminded that, in Fender's entire history, never have they come so close to emulating classic features from their Kalamazoo rival as they did with the Tele Deluxe. Be prepared for a treat when you pick this Tele up, as its necks is simply out of this world, especially when you consider its measly prices. It's unlikely that this guitar would be used for heavy rock styles and, with a smooth drive rather than an out and out distortion, the mid-powered humbuckers really do sound very nice indeed. Agathis is, apparently, similar in tone to mahogany and the Custom certainly produces a fat rhythm tone that remains more than clear enough for most realistic requirements. The neck humbucker is silky and warm with tonal possibilities ranging from jazz to Slash-style solo sections.